The 70 Evolution is for pleasure seekers who believe a beautiful vessel under 100ft should meet the highest performance standards and still expect it to deliver megayacht comforts. From Ocean Alexander's impressive US factory this is hull #1 created to bring astonishing power, truly surprising luxury and advanced design — without sacrificing legendary Ocean Alexander stability, safety and fine engineering. The owner has added all the bells and whistles so you don't have to. All systems just serviced at the OA factory. 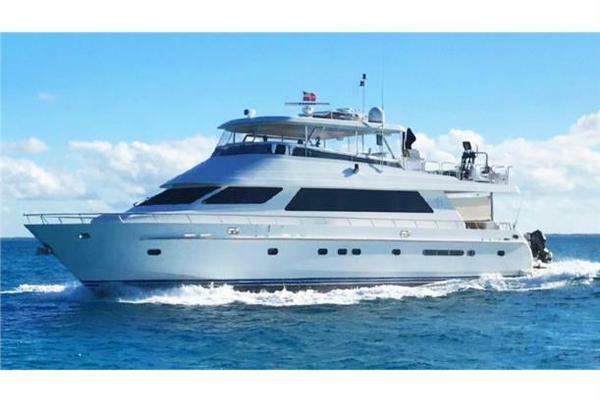 United Yacht Sales New Jersey would love to guide you through a personal showing of this 70' Ocean Alexander 70e 2016. 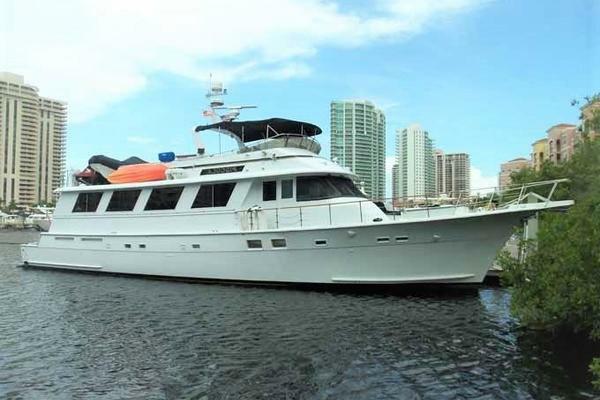 This yacht for sale is located in Fort Lauderdale, Florida and priced at $2,995,000. For a showing please contact us by filling out the form on this page and we will get back to you shortly! SalonAs you enter the salon from the aft deck you are greeted with a wide open layout, the enlarged windows, the walnut cabinetry and sophisticated details all create a stunning first impression. Aft is a comfortable lounge area giving ample space for drinks or watching the cleverly concealed television which is hidden in the overhead. From here you step up into the impressive galley featuring top of the line equipment and granite counter tops worthy of any master chef. A dining table to starboard offers a place to eat whilst chatting to the Captain at the helm. Stairs lead both up to the flybridge from here as well as down to the guest staterooms below.Guest AccommodationsForward you will find the Queen VIP stateroom, gray/white granite side tabletops offset with walnut cabinetry and cream carpeting. The ensuite has a glass vessel sink, shower and head. Gray/white granite, glass tile and chrome fixtures accent the seamless shower stall.There are two guest cabins each with 2 x twin beds, one bunk style and one side by side. All cabins have a cedar lined closet and flat screen TV. These both share an additional guest bathroom with sink, shower and head. Leading aft along the walkway you'll find a washer/dryer concealed in a cabinet and then leading into the Master is a custom stainless steel and granite floor. The full beam King Size Master stateroom has extra large windows allowing for plenty of light whilst white and cream panels juxtapose beautifully with the walnut cabinets giving a very clean contemporary feel. Little details like a device charging station in each bedside drawer, walk-in cedar closet with lighted drawers all elevate SWEET SALT to another level. Aft Deck/Swim platformThe aft deck features a comfortable area for relaxing and dining alfresco at the varnished teak dining table. A wet bar and drop down TV add to the amenities. Aft deck maneuvering controls make docking a breeze. This area leads aft to the hydraulic swim platform which houses the 13' Boston Whaler tender under way and the crew cabin and engine room.Fly-bridgeLeading up the teak steps from the aft deck you reach the spacious fly-bridge. Offering tons of space to hang out and relax. From the open seating area aft, a full bar area with 2 stools, grill and refrigerator, and yet more seating and dining shaded by the hard top, there's room for everyone. Two helm chairs sit forward at the controls.Fore-deckThe fore deck offers yet another place to relax and enjoy the views. A seating and dining table for cocktails plus sun pads for soaking up the sun. There is still plenty of room for anchor and line handling and is easily accessible with the walk around decks. Enlarged windows in salon with custom engineered solution allowing for industry leading window expanse. Enlarged windows with custom engineered solution incorporating composite beams and "sandwiched glass" construction technique from classed vessels. Shower door utilizes "crystal clear" glass custom made for Ocean Alexander. Providing "minimalist and transparent water strips" provides a unique Ocean Alexander proprietary "Crystal Shower"
Opening "In Glass" portlights in MSR, MSR head, Port Stateroom and Starboard Stateroom. Forward VIP has ceiling open portlight. Tender pictured does not come with vessel. 13'3" Boston Whaler 2013, 130 Super Sport. Powered by 40HP Mercury 4 stroke engine.